A small confession: I've been trying to write this blog entry for days. I finally realized I'm over-thinking what I need to say. In fact, perhaps it would be better to show you than tell you. 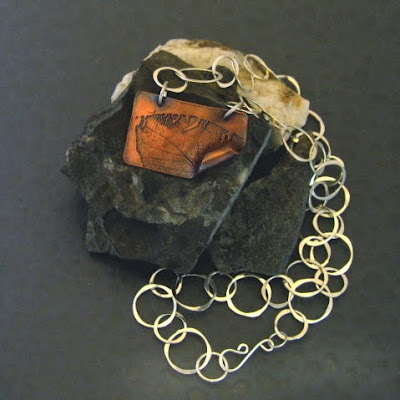 So here are a few pictures of jewelry available in my Artfire studio now. This copper pendant reproduces in minute detail every vein and crack in a leaf I picked up after it had already been on the ground for awhile this past fall. I love the autumn color of the copper, and the rolled edge of the pendant evokes the way leaves curl up and dry out after they've fallen from the trees. With the handwrought sterling silver chain, the necklace is approximately 20 inches long. 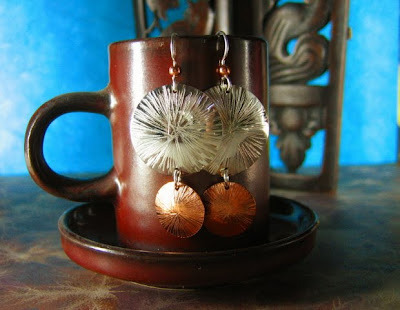 These Starburst Earrings are slightly domed sterling silver and copper disks with hammered decorative lines. This is the larger size, with the upper disk approximately 3/4" in diameter. I also make them smaller, with the top disk approximately 1/2" in diameter. And just for fun, there's a swingy version with the copper disk on top in both sizes. You'll find the pair in the picture in the shop now; please get in touch if you're interested in any of the other versions or in a pendant. This Forest Floor cuff, in oxidized sterling silver, includes raspberry, high bush cranberry, willow, chokecherrry, Siberian pea and other leaves, all gathered on our 10 acres this past summer. The leaves overlap each other, and the edges are sawn a little ragged to mimic the nibbling of insects and squirrels. A bit of decorative hammering adds texture and interest. 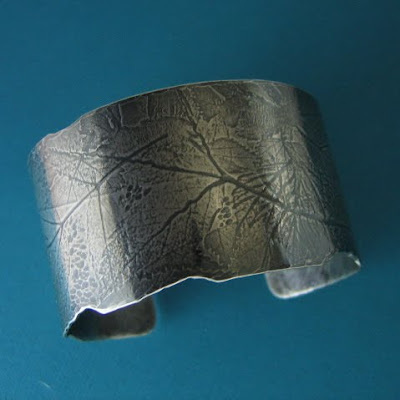 Of course, it's one of a kind, as the leaves are destroyed during the process of imprinting the metal. When you look out the window as you're flying into Fairbanks, you notice scribbles and curlicues carved into the land by the Tanana River. 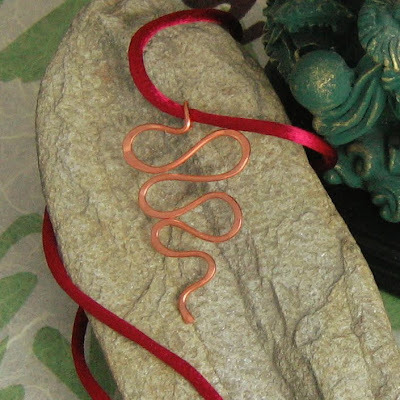 That's the inspiration for this simple Alaska Riverbend pendant made of hammered copper on a satin or suede cord with sterling silver lobster claw clasp. Next up on the blog, more show and tell: A photo essay on how real leaves are transformed into jewelry for the Forest Floor series. Hi Kristin nice to see you on here and your beautiful work. :) I love your earrings and your leaf bracelet and pendant. I hope all is well your way. Your work is lovely, Kristin. 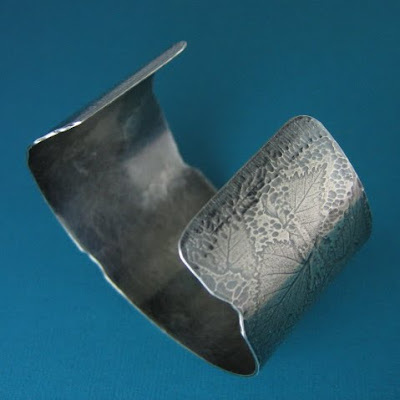 Especially love the Forest Floor cuff - how beautiful!